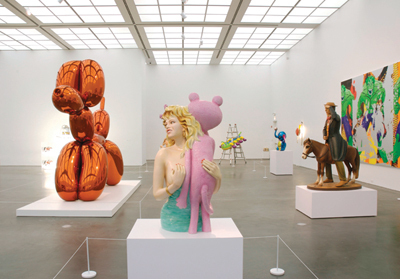 View of “Jeff Koons,” 2008, Museum of Contemporary Art, Chicago. From left: New Hoover Deluxe Shampoo Polishers, New Shelton Wet/Dry 10-Gallon Displaced Tripledecker, 1981–87; Balloon Dog (Orange), 1994–2000; Pink Panther, 1988; Caterpillar Ladder, 2003; Elephant, 2003; Buster Keaton, 1988; and Triple Hulk Elvis I, 2007. Photo: Nathan Keay.